Hiring top talent is critical to the growth and success of every organization. Each company has its own process. Even after your human resources department, or recruiting agency narrows down hundreds of applicants for each job posting, the interview process with the most qualified candidate pool can still be a daunting and expensive task. 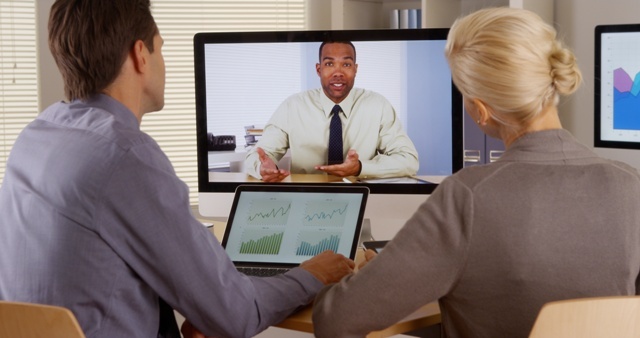 Here’s where video conferencing technology can simplify the hiring process. After candidate applications and resumes are carefully reviewed, your next step is most likely to set up an initial interview in-person or over the phone with several of the most qualified candidates. However, in-person interviews can be costly to bring all the candidates in, not to mention time-consuming. Sure, there are phone calls, but they are not as effective at showing you the whole picture, literally. Meeting face-to-face through video conferencing software, especially when it pertains to hiring employees can really tell you a lot and save you a ton of time in the process. For one, you have the opportunity to screen candidates more thoroughly to see if their resume and application match up before moving them further along in the interview process. Speaking with candidates via a brief video conference gives you the opportunity to evaluate their verbal and non-verbal communication skills, without having to do lengthy in-person interviews. You can better evaluate if they would be a good fit for the role than you can with just a phone call. How professional do they come across in terms of their appearance, attire and posture? Do they communicate effectively and display confidence? Are they energetic and excited about the potential role? Visual cues are critically important. And, if your company will be using video conferencing in your daily business, it’s a great opportunity to see each candidate’s comfort level with this important business technology. Another great benefit is the ability to include other key decision makers in the interviews who may be working from another location or traveling. This is a common hiring issue, and instead of delaying the interview process and potentially losing qualified candidates, multiple parties can participate in the interview process from any device, anywhere. This is incredibly useful and not to mention, practical. For out-of-state and international candidates, you may even opt to just do a series of video interviews and skip the costly and complicated in-person interviews all together. This is becoming an increasingly more popular method for hiring top talent located elsewhere. This powerful tool can save both you and your candidates time and money. In sum, video conferencing provides your business with a cost-effective, time-saving and efficient way to interview and hire new employees. There is a great deal that can be learned from video interviews and many ways it can help to expedite and simplify the hiring process altogether. This will most definitely become a more common hiring practice and one that can really benefit your business both now and in the future.